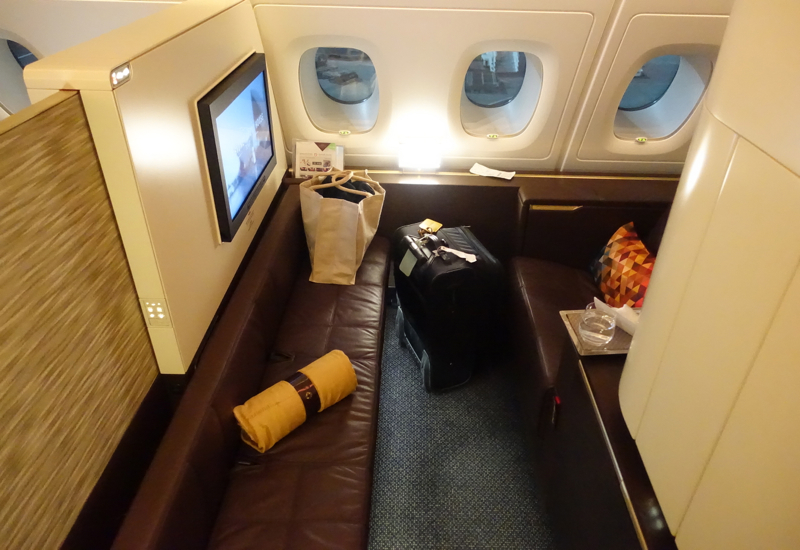 This Review of Etihad Airways A380 First Class Apartment is part of my husband's travel to Australia. 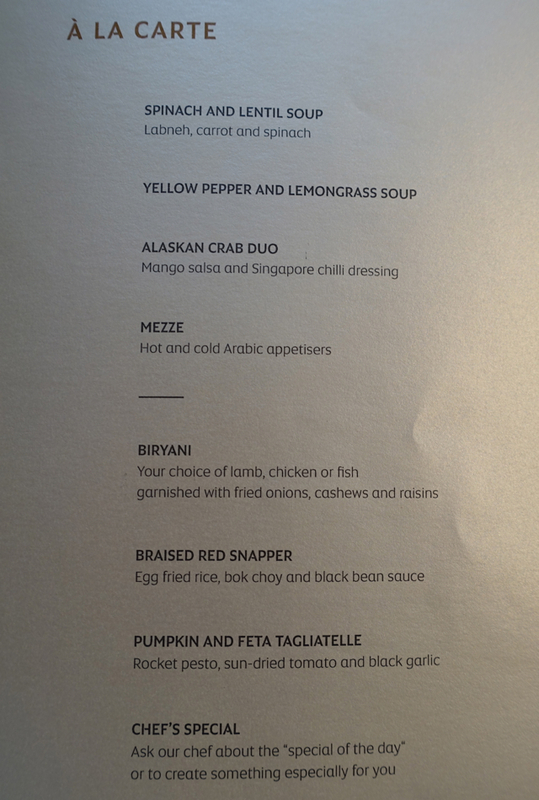 See his prior post on the Etihad Premium Lounge in Abu Dhabi for Etihad First Class and Business Class passengers. 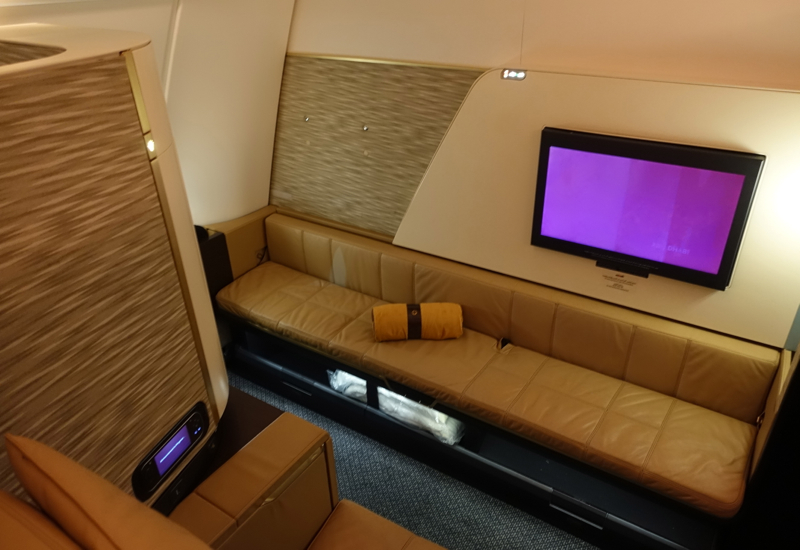 My husband had just completed the first leg of his journey to Sydney by flying from New York to Dubai in Emirates First Class on the A380, and now for his second leg from Abu Dhabi to Sydney he would be able to fly on Etihad First Apartment as a comparison. His first impression was that it was the best First Class cabin he had ever seen. The apartment featured creamy brown leather and very tasteful appurtenances. 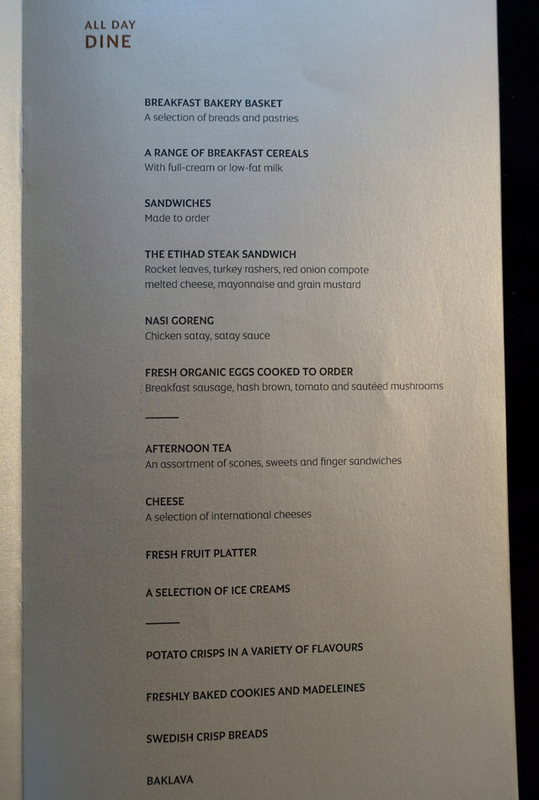 Unlike Emirates with all its glitz and tacky splendor, Etihad has opted for a much more elegant and refined aesthetic. 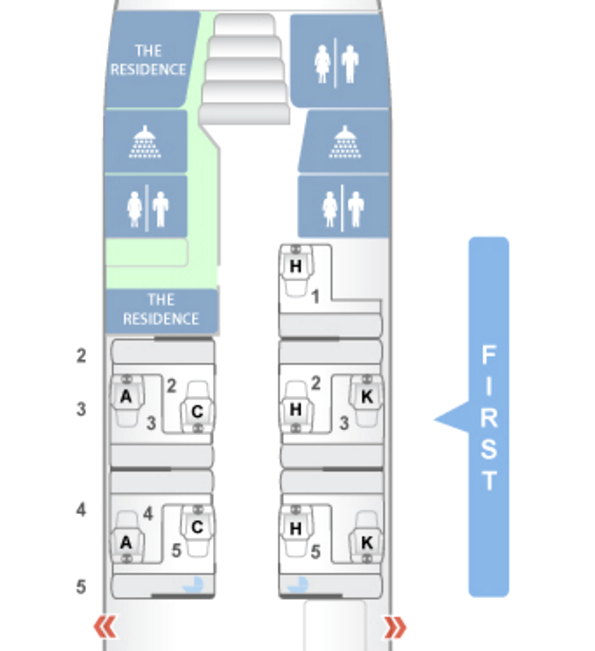 The Etihad First Class Apartment Cabin on the A380 has 9 apartments, 5 on the right hand side of the plane (1H, 2H, 3K, 5H and 4K) and 4 on the left hand side (2C, 3A, 4A and 5C). As you can see from the Seat Guru seat map, only 4A and 4K are both forward facing and by the window, and these are the ones I'd recommend, since in general it's a bit more private to have your seat next to the window instead of next to the aisle, and most people prefer their seat to face forward. Though if you're indifferent to which direction your seat faces, then rear facing window seats 3A and 3K are also good choices. If you're traveling as a couple, then I recommend selecting 3A and 4A or 3K and 4K, and avoiding 1H and 2H, which are both aisle seats. 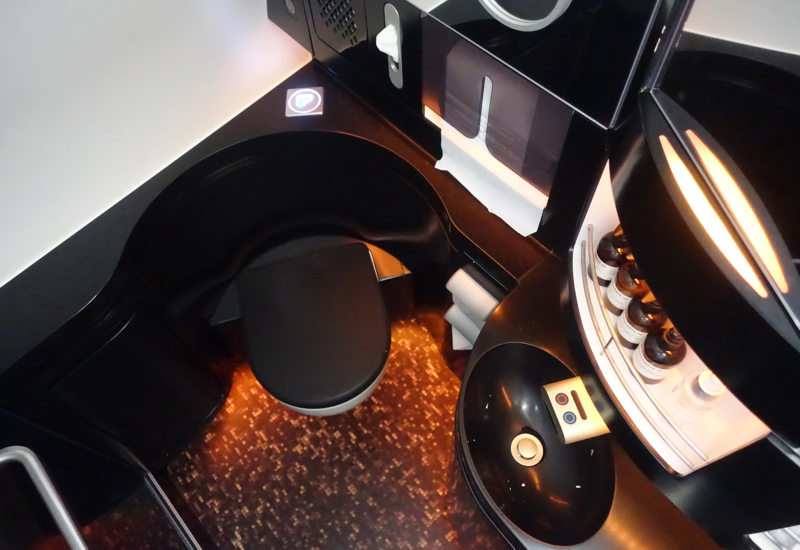 For a photo of how the paired seats look with the divider down, see my son's post, Kid's Review: Etihad First Class Apartment A380. The seat occupies just part of the apartment, much of the space is devoted to the flatbed, which is usually kept folded in half into a narrow runner bench. 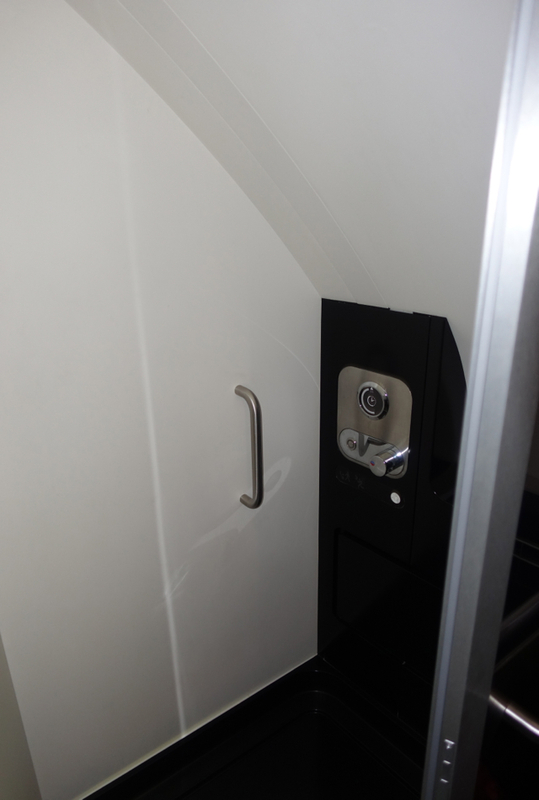 Opposite the bench there is a small compartment which opens out into a mini-bar and vanity. When you are not sleeping, this bench is too narrow to use a comfortable place to sit. So although the apartment at first glance looks quite elegant, it is not so useful. In addition, the large apartments are separated by relatively low partitions, so whenever you stand up it is easy to see what is happening in the apartments of your neighbors. So do not expect much privacy. However, there is very good and useful storage space under the bench. In general, my husband was very impressed by the aesthetics of the apartment, but not as much by its usabililty. The seat itself is very wide, with more space than most of its competitors, and is very comfortable. It is well-positioned to view the entertainment screen, which can also swivel out should you wish to watch a film from the flatbed. His biggest complaint about the seat is that it does not really recline very far. Because the seat and flat bed are distinct components, for purposes of maximizing the apartment space the seat has been designed to only recline about 20 degrees or so (having flown Etihad First Apartment on the return, I'd say the recline is more than 20 degrees, but this was his assessment). So if you wish to really stretch out your only option is the flat bad, which of course is always perfectly flat. If for some reason you enjoy reclining more than 20 degrees but less than 180 degrees, you are out of luck. After having just hours ago experienced the Emirates spacious and opulent shower, my husband was let down by the shower on Etihad. 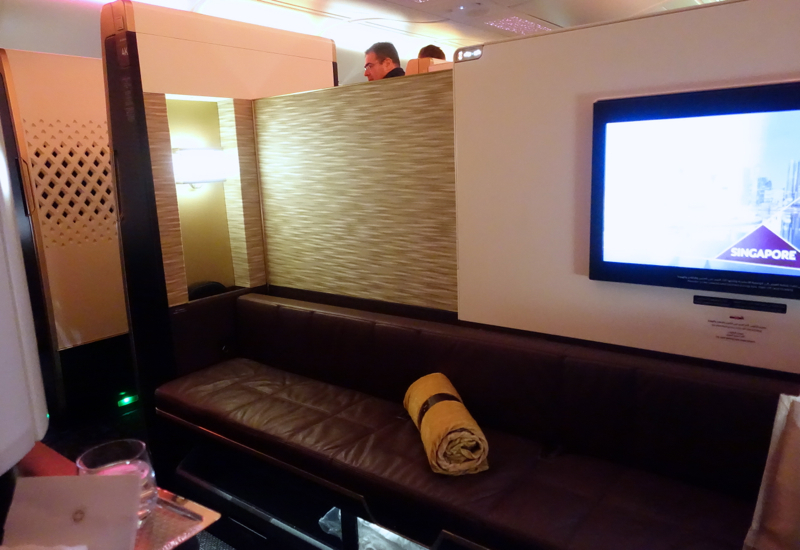 By comparison, the bathroom area is tiny, not much larger than a normal First Class bathroom. My husband is about 6'5″, so it didn't help that the shower is 6'4″ at its tallest space, which is itself only 8 inches wide as the ceiling quickly slants down to a much lower height. The water pressure and temperature was fine. There was only a very small space to dry off, and due to the lack of towel racks he had to rest his clothes n the closed toilet. Perhaps he had been spoiled by the Emirates shower room, which has heated floors, hairdryers, soft lighting, and at about five times the square footage of the Etihad shower has abundant space for storage, but my husband was not much impressed. 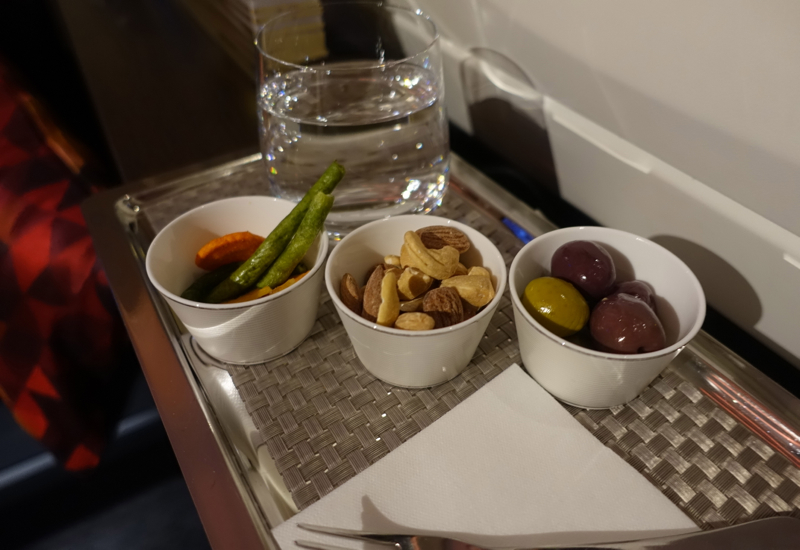 My husband could care less about airline amenity kits, but this is an area where Etihad offers less to its first class passengers than several other airline first class products. 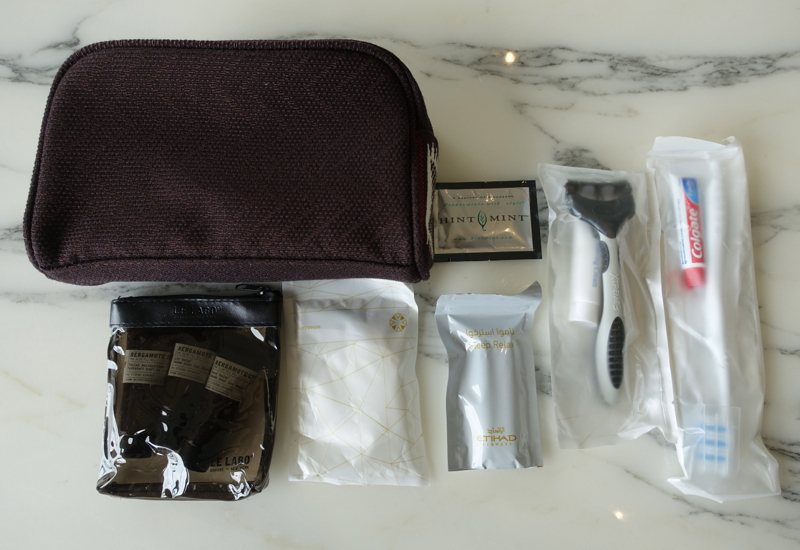 The amenity kit is provided empty, in the vanity area, and the Le Labo products, toothbrush, sleep mask, ear plugs, etc. are in pockets along the side of the vanity area. My husband was happy with the Etihad pajamas, however–he noted they were soft and big enough for his 6'5″ frame, which isn't always the case. There are also black slippers provided. My husband was offered a pre-flight drink, but only wanted water. 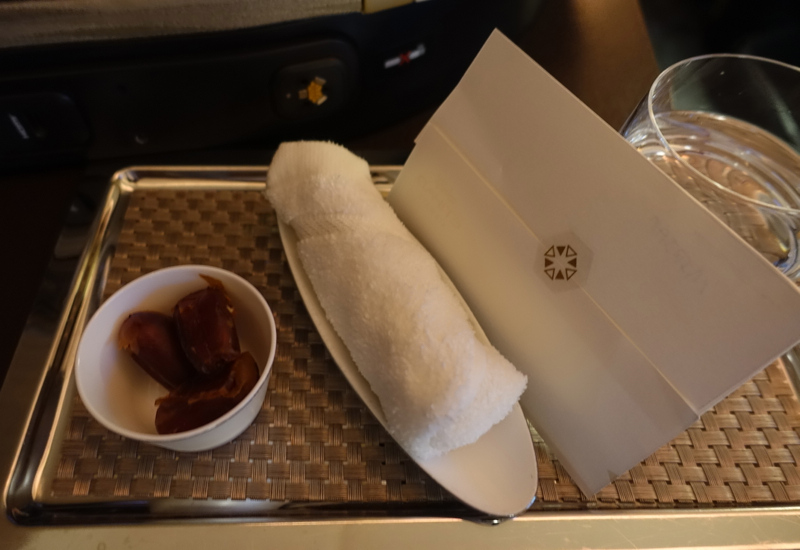 Next, he enjoyed the pre-flight serving of dates and Arabic coffee, and a refreshing cool towel. 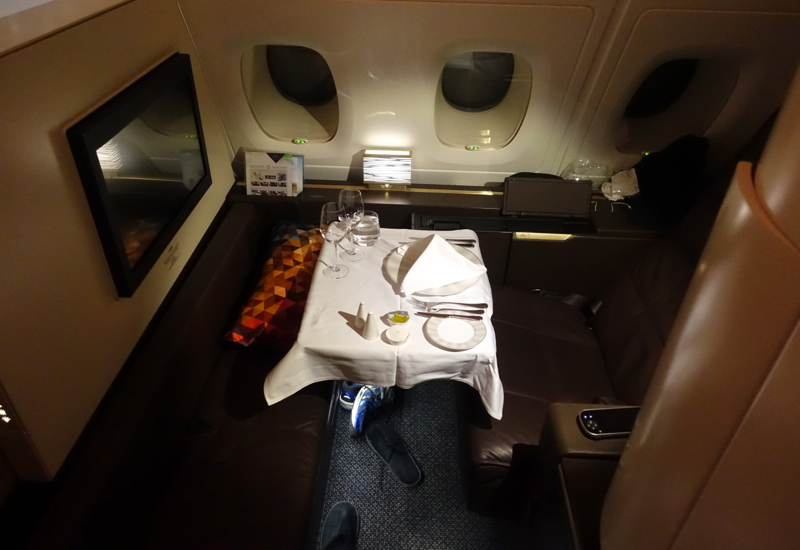 As with many other First Class suites, you're able to dine with a companion, with you in the chair and your companion on the seat bench, which has a seat belt for a dining companion. 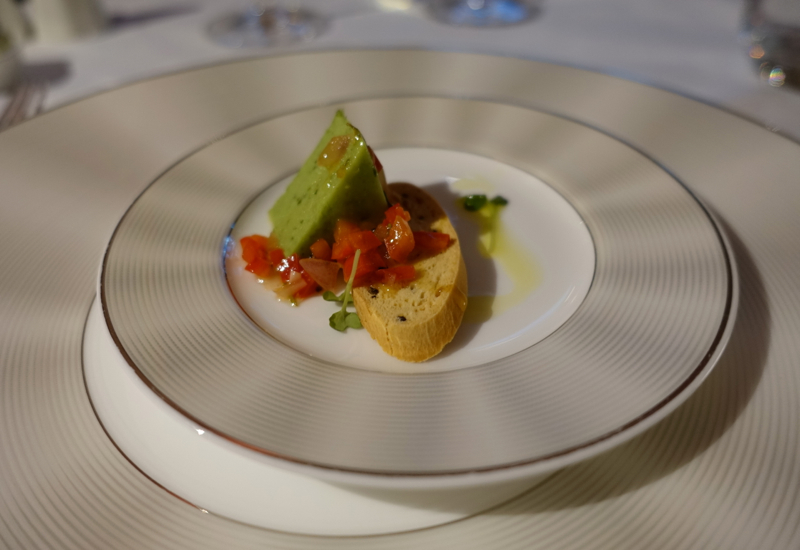 After take-off, he was brought a snack of olives, cashews and vegetable chips, and then an amuse bouche with avocado mousse and bruschetta, which were quite tasty. 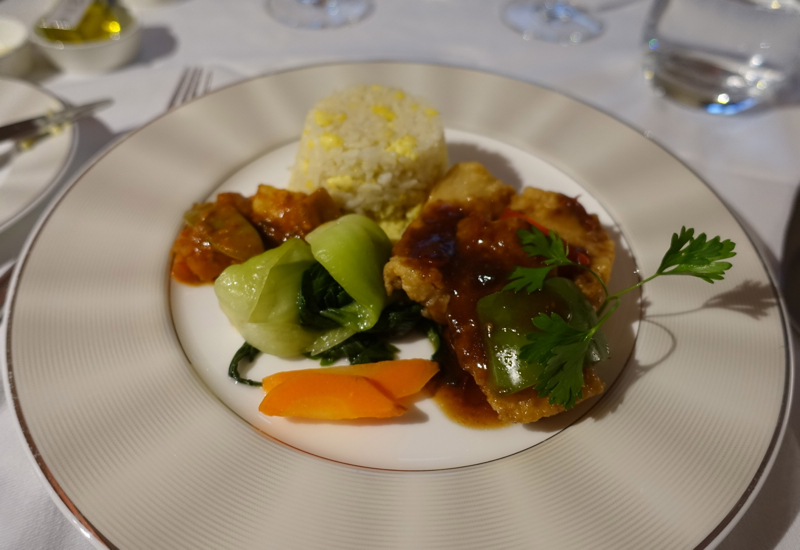 Next, he enjoyed and red snapper with egg fried rice, bok choy and black bean sauce for his main, which paired brilliantly with the wines the chef had suggested. 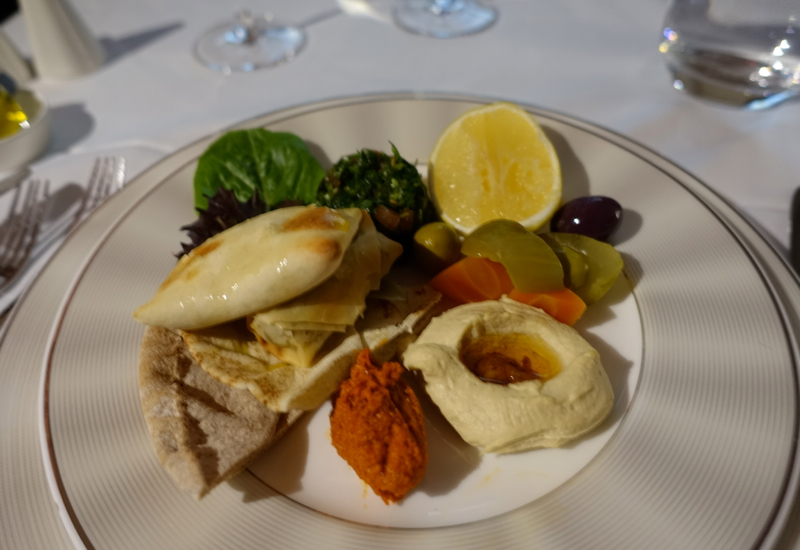 The red snapper was good enough, while the soup and mezze were perfect. 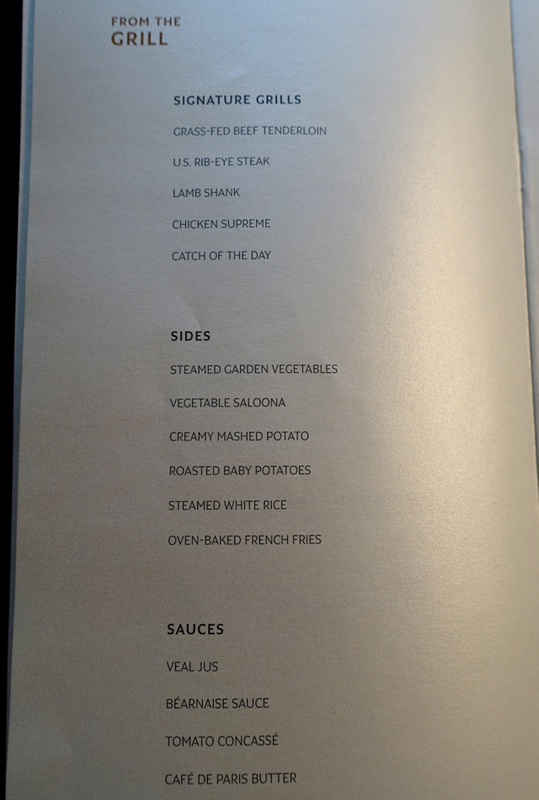 He noticed that the menu seemed to offer a great selection of items from the grill, including beef tenderloin, steak, lamb shank, chicken or fish, with a sauce of your choice, but my husband was not keen on eating red meat before going to sleep. 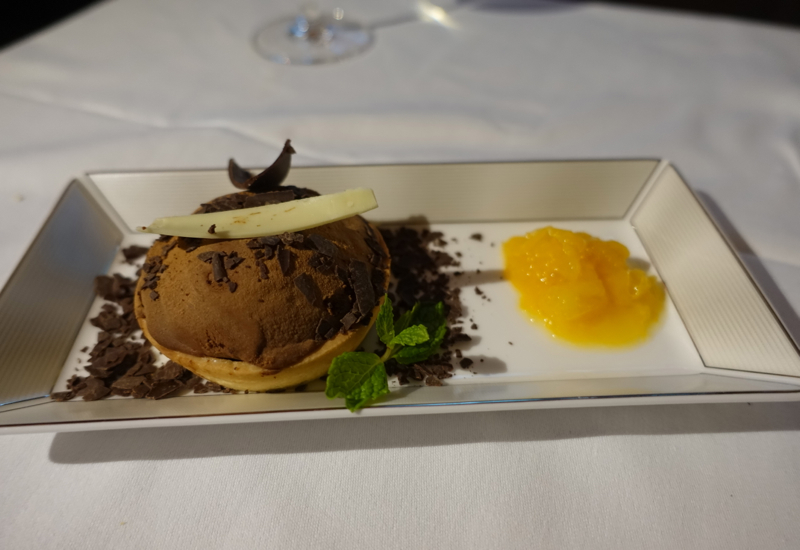 For dessert, he chose the cherry chocolate torte. 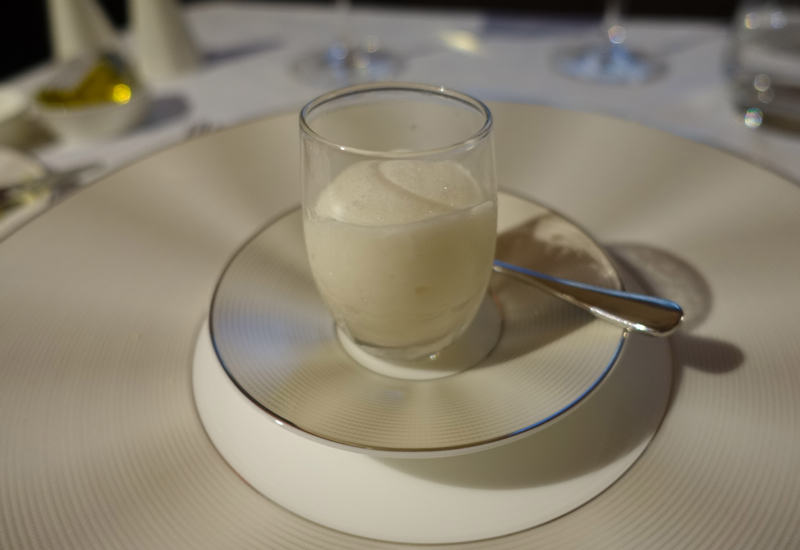 He thought that this, along with the palate cleanser, were the highlights of the meal. For breakfast he ordered an omelette, which was served hot and fluffy, very delicious. The pastries were rather bland, but the mint tea was good, as was the feta salad and olives. 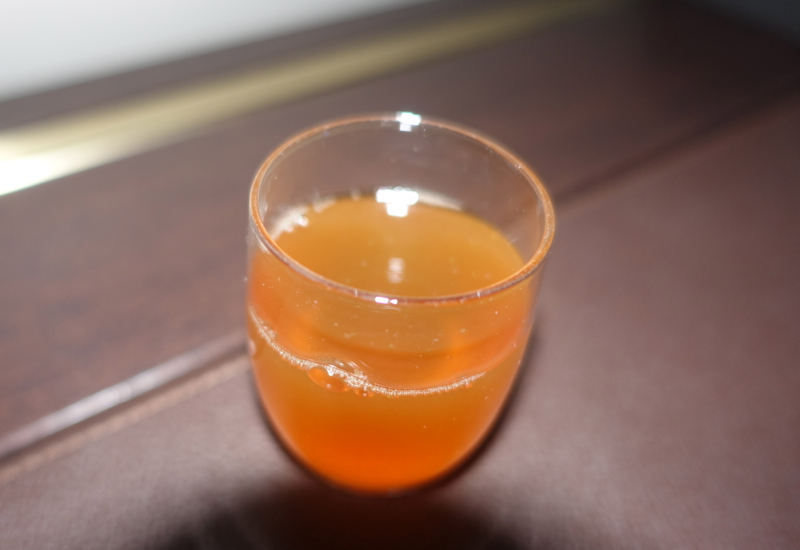 Finally, before landing in Sydney, he was served a shot of lemon ice tea, which was a very nice, refreshing touch. When the bench is unfolded it doubles in width, and becomes very spacious, both wide and long. Unlike some other First Class flatbeds, this bed is indeed perfectly flat. 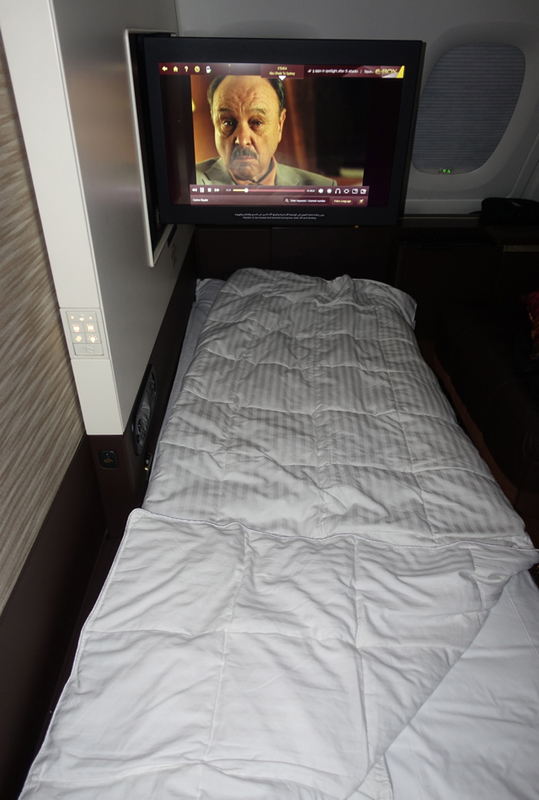 Despite the ample size, my husband found that the bed was rather hard, even with the mattress pad, and expressed surprise that an airlines would go to such lengths to offer such an opulent flatbed product without bothering to add a simple roll of memory foam or a thicker mattress pad to add greater comfort. He also found that because the entertainment system swivels out from the wall near the window, the head-pillow is placed at the other end of the bed, which is just inches from the aisle. And because the closing doors of the apartment provide only some visual privacy but no sound insulation, he found it disconcerting to try to go to sleep with his head so close to the movements of others in the aisle. He said that he could have switched the location of his head and feet for more privacy, but that is not how the bed is made up initially. 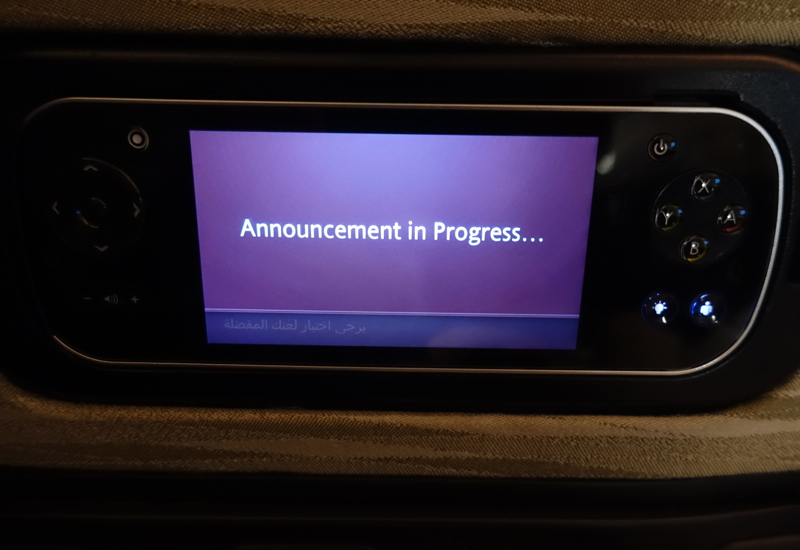 My husband is easily flummoxed by entertainment systems and their related ipads and remote controls, so he was happy to report that he found the Etihad system to be extremely intuitive and easy to use. On the other hand, he found that the film selection was very limited; although he did greatly enjoy watching the suspense film “The Gift” while he was still awake. The flight crew was very friendly, and very eager to help with and explain the various features of the apartment. 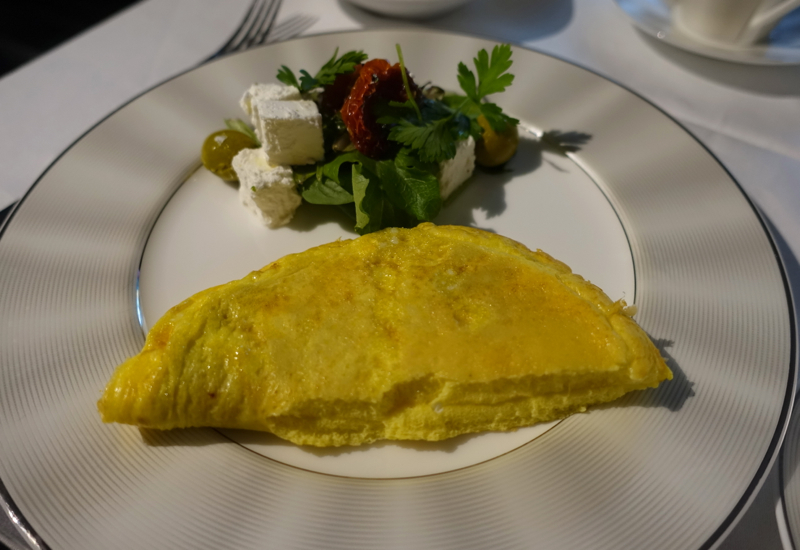 The flight attendants were very proactive in wanting to help plan the timing of the meal, shower, and wake-up time, rather than simply respond, and my husband found this to be very helpful. 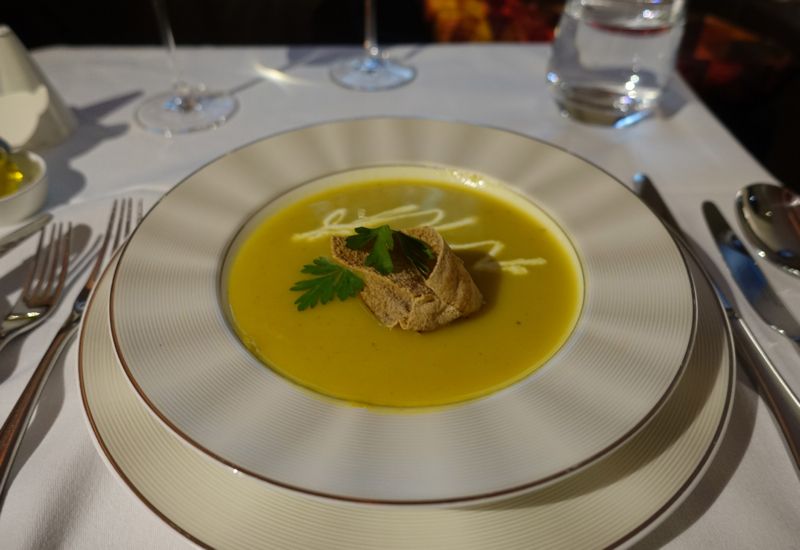 The chef introduced himself and made some great suggestions for wine pairings with the meal. In addition, the attendants were very eager to help with arrangements for the shower. Overall, the service was optimal: just the right balance of helpfulness without intrusion. My husband found the apartment to be more aesthetically pleasing than perfectly functional, although overall it still is an extremely luxurious experience. 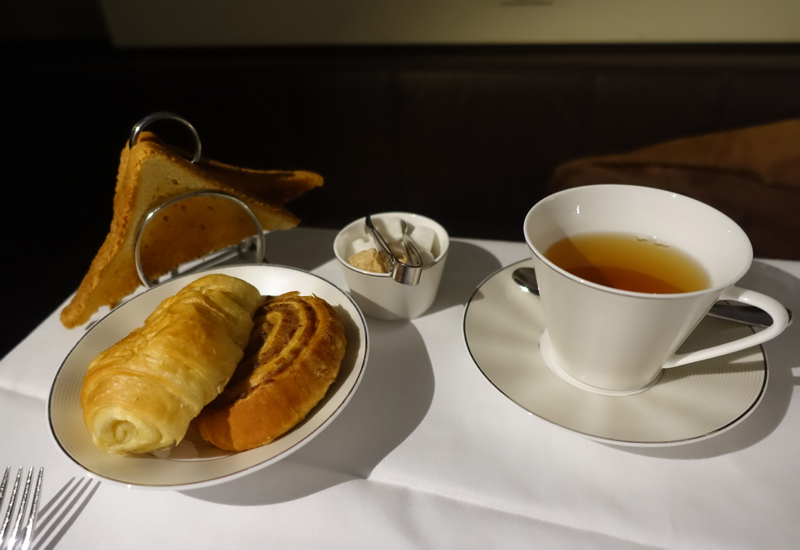 The Emirates shower is vastly superior to Etihad, but in most other respects my husband found the Etihad flight to be significantly more enjoyable. 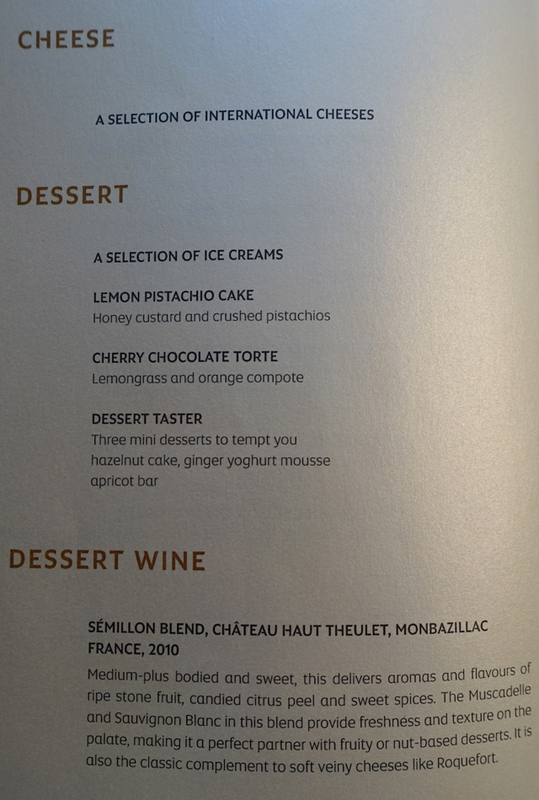 The service was perfect, the food was very good, and very large apartment made the flight a perfect start to his vacation. 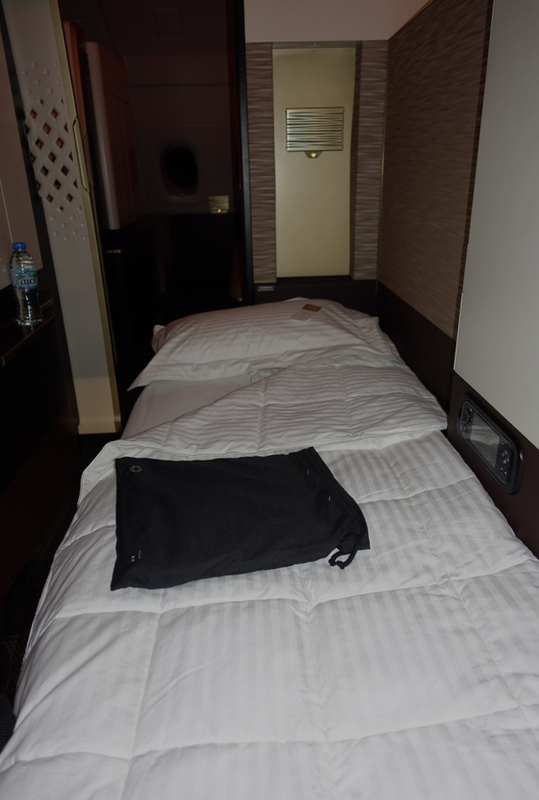 If' you've flown Etihad First Apartment on the A380, what was your experience?